I woke up this morning and received a breathless email from Cecilie Surasky, the Deputy Director of “Jewish Voices for Peace.” The email gleefully announced that in anticipation of the AIPAC Policy Conference in DC and the arrival of thousands of Israel activists from across the US, JVP arranged for the placement of 100 large back-lit ads to be plastered across the busiest Metro stations in Washington, D.C. The ads read as follows “Jewish and proud and AIPAC doesnâ€™t speak for me – President Obama and Congress: Most Jewish Americans are pro-peace. 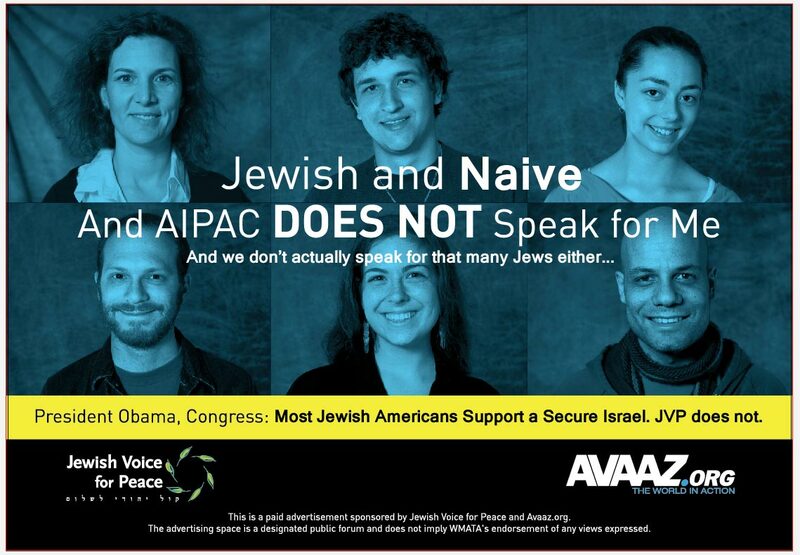 AIPAC is not.” The email then urges JVP’s “legions” of followers to flood the White House and Congress with this message. JVP claims to support the aspirations of both Israelis and Palestinians but in the JVP world view, the Israelis are always wrong while the Palestinians can do no wrong. They support BDS, the Security barrier around the West Bank is a severe human-rights violation, but no mention is made of the horrific terrorist attacks it has prevented. They “will not quietly witness the violation of human rights in Palestine” but they will stand mute at the violation of human rights by Palestinians. By ignoring the context of the conflict, JVP necessarily demonizes Israel and infantilizes the palestinians. Thats what happens when you blame Israel for everything and treat the Palestinians like some kind of retarded appendage with no mind of their own, incapable of formulating the minimum level of willful behavior necessary to attach any kind of culpability whatsoever. So yeah, screw you JVP. You don’t speak for me and from what I can tell, you don’t speak for hardly any Jews at all except for the disaffected whack jobs at your rallies who seem to have lost a couple of their marbles. Anyway, I rejigged their sign in Photoshop as you can see below. Click here to download a larger version that you can print and stick on any wall anywhere like say… Madison Square Garden or the Taj Mahal or the Washington DC Subway… those are just some random suggestions. In all cases do not break any laws or deface public or private property when putting up my version of the JVC poster. JVP are ENEMIES of Israel and America. Well Rae we have an idea… they claim 100,000 “supporters” but are shooting for 20,000 messages to Congressmen and the White House. So can we assume that 80% of their list is useless? I would just add that even when someone isn’t sufficiently pro-Israel, that still isn’t a valid reason to Jew them on the tip. I found you by following a link. At first I liked the idea of a website called “Jewlicious.” However I see that you’re quite Conservative and hate people who aren’t. As I understand it, Zionists believe that Israel is only for Jews and killing Palestinians is a righteous thing to do. By that reasoning, I am not a Zionist. I want everyone to get along. I cried when Rabin was shot but I get the feeling you popped the champagne cork and probably thought the settler that killed him did a mitzvah. AIPAC is Israel is right no matter what it does. I don’t ascribe to that view. I don’t like it when settlers displace Palestinians and I don’t think that Israeli Jews are superior to Palestinians. I think that both belong there and should get along. I also get the feeling that you’re pro Haredi and cheer when they throw rocks at women they feel aren’t modest enough. And the Jews that are doing that in Brooklyn. In your eyes, Jewlicious means screw everyone else and only your sect are true Jews. Sorry, I’m a Jew and a proud one. But I’m not a Zionist. I was not raised to be a Zionist. I find it interesting how Jews, who were driven out by pogroms are all too willing to visit the same pogroms on Palestinians. Karen, as I understand it, you’re an idiot. #themiddle > actually YOU, are an idiot. Prove it. I can point to numerous errors of fact and substance in Karen’s idiotic comment. What’s your evidence? I love your comment. My opinion exactly. I feel like this entire blog could’ve been a great outlet for discussing contemporary Jewish issues but it’s just turned into a hateful, conservative, and silencing blog that insults anyone trying to express their own views on peace and humanity. Same as my comment to your other username just now. Dude, if you’re going to pretend you’re someone else, at least do a decent job and try to write something on point. What’s with all the trolls we’re getting these days?